Tu Bishvat is mentioned in the Talmud purely on a Halachik level, there is actually no mention of the custom of eating fruit or anything of the sort. The Mishna tells us that Tu Bishvat is the Rosh Hashana of the trees. We will first give 2 examples, which will give us a better understanding into what “Rosh hashana for the trees” means, and we will then proceed to give a 3rd example which also effects Shmitta. We have 6 years of Ma’yser, and as we know this year we are going through is the 7th year, the year of Shmita. It is a very special year, especially for farmers. I once heard a story from a Rabbi who Davens with us, regarding one of the Kibutzim which decided to keep Shmita in the proper manner for the 1st time, and during that year they managed to invent an unbelievable invention, as a direct result of the fact that they took that year “off”! Next year, which will be the 1st of the 7 year cycle, is a year in which we give Ma’aser Sheni. As we know, we give Truma Gedola and Ma’aser Rishon every year, in the 1st and 2nd years we also give Ma’aser Sheni, we take a 10th of our entire produce, and we bring it up to Yerushalayim, where we are commanded to eat it, and if it is too hard for a person to bring so much produce to Yerushalayim with him, the Torah told us that you can redeem the fruit with money. The Kedusha from the fruit then transfers on to the money, and you can then bring the money up to Yerushalayim, where you buy food with it, and the Kedusha which had been transferred to the money, now transfers over to the fruit which you bought, and you then eat that holy fruit in Yerushalayim. When the 3rd year comes around, instead of Ma’aser Sheyni, you give Ma’aser Ani, on the 4th and 5th years you revert back to Ma’aser Sheni, and then on the 6th year Ma’aser Ani again, which means you give a tenth of your produce to poor people. On Shmita, all your fields are Hefker, you are not obligated to give any Ma’aser, as it is all Hefker. What is the day that differentiates between the years? For instance how would we decide if a certain fruit is the product of the 2nd year or the 3rd year? Anybody who would be asked that question would immediately reply that it is Rosh Hashana, surely the beginning of the year is what determines which year the produce ‘belongs’ to. While this answer is correct, it is also incorrect. It is true that Rosh Hashana is the determining day, but it is not the Rosh Hashana that we are accustomed to, rather it is the Rosh Hashana for the trees, and when is this day? Tu Bishvat. 3 years from now, will be the year 5778, it will also be the 3rd year in the Shmita cycle, but if any fruit grew a 1/3 of its full growth before Tu Bishvat of that year, we will not have to give Ma’aser Ani on it as if fit for a fruit of the 3rd year, rather we will be obligated to give Ma’aser Sheni as if fit for the 2nd year, meaning that the “Rosh Hashana” which determines which year the produce is considered to be a fruit of, is the day of Tu Bishvat. Recently a few people, one of them a doctor from our community, asked me a question regarding Orlah. He has a garden, and he was given a fruit tree, and he wanted to know if the Halachos of Orla apply to the tree, since the tree is actually a few years old already, but on the other hand he is re-planting it in his garden. And the truth is it depends. If the tree is brought with all of its roots and the soil in which it grew then the Halacha differs from a situation where the tree was brought “bare”. What we are trying to point out is that this “Rosh Hashana for trees” effects the Halachos of Orla as well. How long is Orla? 3 years. But when does the counting begin? From the day the tree was planted. But if a person planted the tree 30 days before Rosh Hashana (in actuality it is 44 days before Rosh Hashana, where do the extra 14 days come from? That is how long it takes a tree to actually attach itself to the ground) it is already considered a full year as far as the Halachos of Orla are concerned, and so how long will you have to wait for the whole “3 year” Orla period to pass? You will only have to wait another 2 years. Right? Sort of…. It is true you will have to wait 2 years, but the 3rd year will only end on Tu Bishvat, so in reality it is almost 2 and a half years, still not the full 3. Why? –because “Rosh Hashana for trees” effect the Halachos of Orla as well. I was born on a Moshava, I’m not originally from the city, my father was a Rabbi, I always like to mention this fact out of respect for my father. We grew up in Tel Mond in the Sharon, my father was the Rabbi of Tel Mond and Lev Hasharon, and many other Moshavim in that area. We had trees in our house, and even though father was the Rabbi, when we came home for vacation we used to work together in the Garden. Another example, a person has to give Ma’aser on the fruit of any given year, during that actual year, meaning you can’t give Ma’aser on the fruit of 5776, a Ma’aser Sheni year, via fruit that grew during 5777. As soon as a year passes, you are not permitted to give Ma’aser from the ‘new’ fruit on the ‘old’ fruit, and when is it considered that a year passed? Tu Bishvat, that is the Rosh Hashana. What is the ruling regarding a tree which grew a 1/3 during this year, a Shmita year? Does the fruit have Kedushas Shvi’is? Yes. 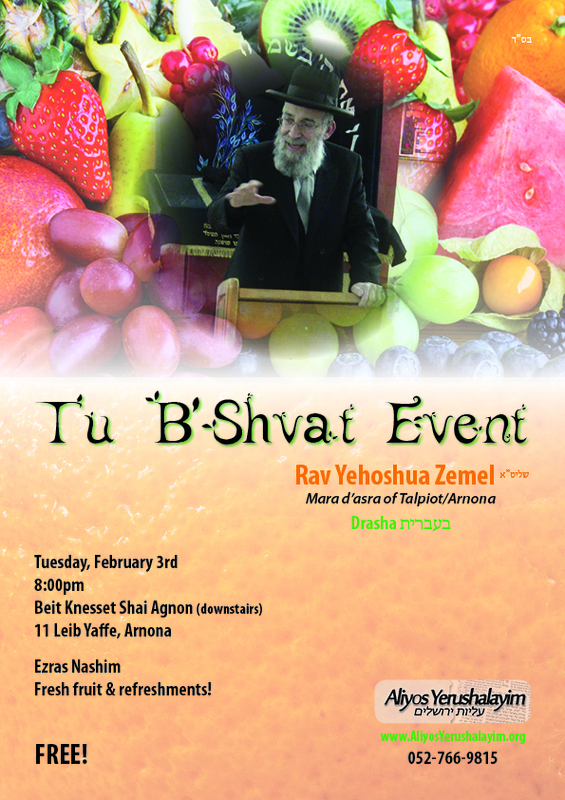 The Shla Hakadosh learnt in the Rambam that Tu Bishvat is the determining day during Shmita as well, and as such, fruit that completed a 1/3 of their growth before Tu Bishvat during a Shmita year, are considered to be produce of the previous year, and they therefore are not K’dushas Shvi’is, and on the 8th year as well, fruit that completed a 1/3 of its growth before Tu Bishvat are considered to be produce of the previous year, the Shmita year, and therefore they have Kedushas Shvi’is. This interesting situation causes leniencies and stringencies. It creates a leniency for the Shmita year itself, because any fruit that completed a 1/3 of its growth before Tu Bishvat is not yet considered to be produce of Shmita, but it the same exact way it creates a stringency for the next year. This is the Halachik ruling of the Shla Hakadosh, and there are those who learn this out of the Sifra as well. However most of the Poskim disagree with this, and the Chazon Ish goes out very strongly against this, they understand the Rambam as saying, that the Rosh Hashana regarding Shmita is the Rosh Hashana at the beginning of the year and not Tu Bishvat. In summery, we see a wide variation of Halachik areas which are effected by this amazing day “Tu Bishvat”. So how did we end up with the Chag we celebrate today? For the Chassidim, Tu Bishvat is a very important Chag, why? Because “man is like a tree in a field”, a person is equated to a tree- even though if you look at the actual Passuk in Dvarim, Rashi explains that it means that you are not permitted to cut down fruit trees even at time of war, for why should you specifically cut down trees which bear fruit? Cut down a baron tree instead- However we do see many times in the Gemara that a person was equated to a tree. The Midrash says that just as you are not permitted to ‘touch’ a tree for the first 3 years of its life, so to a with child, till the age of 3 you permit him to do pretty much do as he pleases, you even let his hair grow out in an unkempt way, but when he turns 3 you give him a haircut, why 3? Just as fruit is Orla for 3 years, so to till the age of 3 a child does not yet know how to speak properly, and so we do not want to burden him with anything, but at the age of 3, as he enters his 4th year, he is just like the fruit which is Kadosh on the 4th year, just as during the 4th year of a child’s life we begin to teach him “Torah Tziva Lanu Moshe”. Leading up to when he turns 5 when he becomes of age and can begin to learning Torah. The holy books teach us many additional very important things about trees, things which are of great importance for all of us to know. It says “The land is filled with your belongings” (מלאה הארץ קנינך) what does “filled” mean in this context? The Pri Tzadik (Rabbi Tzadok of Lublin) explains that you need to learn things from everything in this world, for everything has a purpose. And so what do we learn from the tree? First, the tree is always growing, if you see that a tree is not growing anymore, it means that there is a problem with the tree, the nature of a healthy tree is to grow, so too a person, we must always be growing, advancing, and if we are not advancing…..-AUDIO WAS UNCLEAR. As the Passuk says “To the wise the way of life is up, in order so that they should be able to depart from the downfall” The Gaon of Vilna says, if a person is not going up, he is surely going down, that is the rule. If a person is not advancing, he doesn’t stay in one place, rather he is going down, that is the 1st thing we learn from the tree. Secondly, the Maharal says, a tree without roots can’t grow, we can’t actually see the roots, but it is those roots which connect the tree to the ground, it is only thanks to the strong roots that the tree has underground, that any growth is possible over ground. Without that connection to the ground, the tree has no ability to grow. So too by a person, the main part of our body is our head, it points upwards, for a person’s real roots are in heaven, it is true that we who were created from the earth, but we were created always ‘pointing’ upwards, why? Because a person was created with a Neshama, and the Neshama was chiseled out from under the Kisey Hakavod, every person has A Neshama! and that Neshama is our roots! Another story! I was witnessed a very interesting situation! This must have been about 5 years ago, and it was shortly before Rosh Hashana, and we didn’t have a Minyan, and so I told one of the Gaba’im that I am going to ask the policeman who was standing outside to come in to help us with the Minyan, now you have to understand, the policeman was there together with a policewomen, they weren’t there for fun! they were there because they were stopping people to ask them for license and registration. I went over to them and I told them- look there is a Shul here and we are short of a Minyan, the policewoman (she was the supervisor) asked me ‘where is your Shul’ and so I answered ‘right of over’, she asked ‘are you going to give us a Bracha?’ I answered ‘of course’, and then she turned around to a man that they had stopped, and she ‘commanded’ him “go in and help them with their Minyan, and if you do I am going to let you off of a ticket this time”, and so he came in. This man knew me, he was a local, he had come to do some last minute shopping and so he forgot to take his license with him, and he was stopped by this policewomen! What I am trying to point out is that the Neshama of a Jew is an unbelievable thing, why? Because it was chiseled out from under the Kisey Hakavod. This is what the Maharal says, a man has to be connected with that which is above him, true we can’t see what is above us, but it is just like the roots of a tree which we can’t see, they are covered by the ground, but that is where the tree gets its strength from, so too a human gets his strength from above. Tu Bishvat has another amazing aspect to it, the Ashkenazim have the custom to eat fruit on Tu Bishvat, but not just any fruit, specifically fruit which come from Eretz Yisroel, why? Maybe to remind us that it is the Rosh Hashana for the trees and the fruits. But I think there is another reason, it is brought down in the holy books that the main praise of Eretz Yisroel is its fruits. 5 of the 7 species which are special to Eretz Yisroel are fruit. It helps us remember how special Eretz Yisroel is, by eating the fruits which are special to the land. If you buy raisins from California or Cyprus you haven’t achieved anything! We must specifically buy from the produce of Eretz Yisroel, we prefer taking a small fruit from Eretz Yisroel, just so we can make a Bracha on it. We say in Al Hamichya “We will bless you through it with holiness and purity”, what do holiness and purity have to do with Al Hamichya? the Ba”ch explains that it is because the fruits of Eretz Yisroel make you holy! And so Tu Bishvat is a special day for Eretz Yisroel, a day in which he have to speak the praise of Eretz Yisroel, the purity of Eretz Yisroel, and to always know- that just as Hashem told Avraham “Go from your land…. To the good land which I will show to you”, Eretz Yisroel is good! it is special! And on Tu Bishvat we must recognize the connection that there is between the tree and the person. There of course are many other things which connect us to trees, you can think of further ideas on your own, and any positive thought you have on the manner….. will automatically be considered as true thoughts. I wish upon all of us, that we will always merit to be ‘the head’, not out of haughtiness, but just like the trees roots are in the ground and giving strength to the tree, so too our heads will be like a ladder which has its legs in the ground and its head in the heavens. When I was thinking of speaking about this subject today, I was thinking that this may be a reason for why we wear a Kipa, because we always have to feel that we are attached to something that is above us, and it would not be fitting for us to be ‘connected’ without having a head covering. The Gemara says that a head covering symbolizes ‘fear’, we are not merely down here, we are connected to something way up there, it gives us the strength. May we merit to hear only good things, and have all the ‘New years’ come upon us with all the good. Someone who gets married a day after Tu Bishvat doesn’t fast, the Magen Avraham asks, why? During the entire month of Nissan one is not permitted to fast as an individual, and yet a Chosson does fast a day before his wedding, but on Tu Bishvat not? And he answers that not fasting in Nissan is just a Minhag, and therefore a Chosson has to fast. But Tu Bishvat is brought down in the Gemara! But all the Gemara says is that it is considered to be a Rosh Hashana, it doesn’t explicitly say that you do not fast. The idea is that it says there are 4 Rosh Hashanas, and they are all equal to each other, and since the Rosh Hashana at the beginning of the year is a holiday so to all the other Rosh Hashanas should be treated as such, and just as you of course may not fast on the “real” Rosh Hashana so to you may not fast on Tu Bishvat. The Admorim speak about the fact that a person must always “renew” himself during these times, because the Gemara says that most of the rain fell already, and this gives the tree a new strength, everyone has to find himself anew, and I am telling you, it is not hard, you have to move forward and renew yourself just like the trees begin to do so.